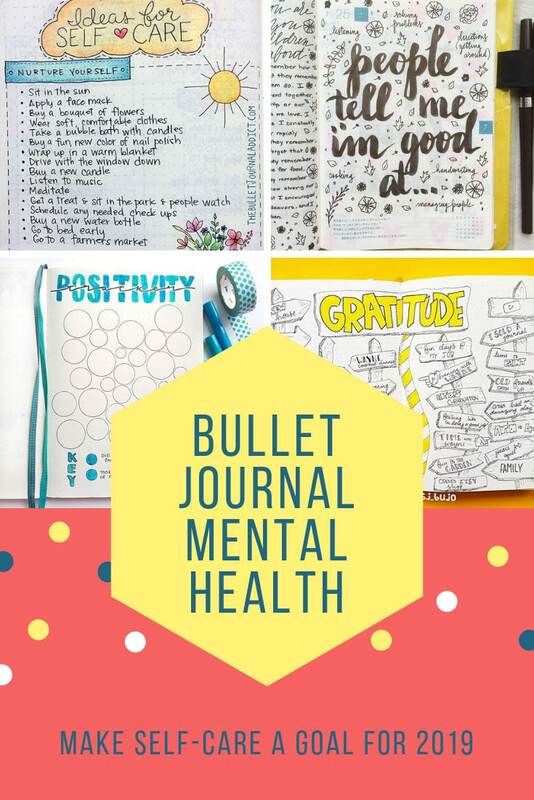 Today in our ever growing collection of Bullet Journal trackers we’re going to take a closer look at how you can use your BUJO to look after your emotional health. 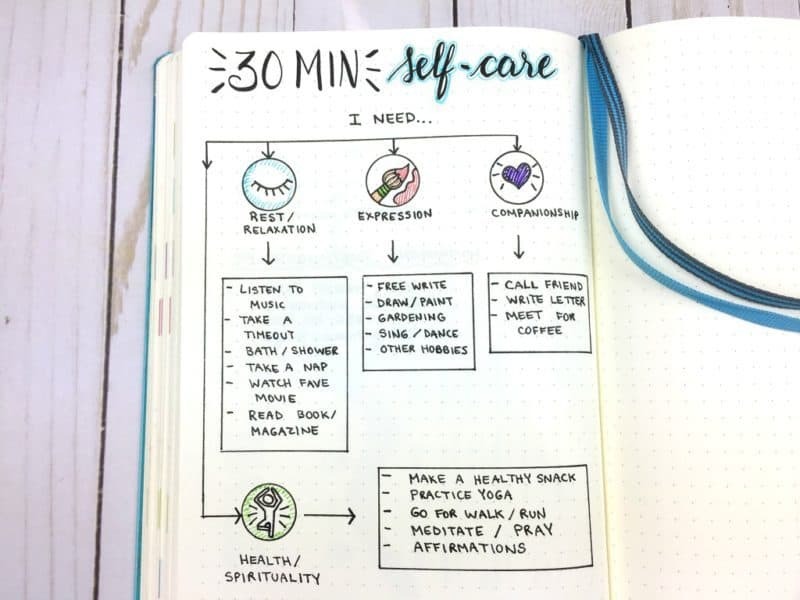 One of the top recommendations for practicing self care on a regular basis is to start a journal. This is so helpful, easy to do, and won’t cost you a lot of money. 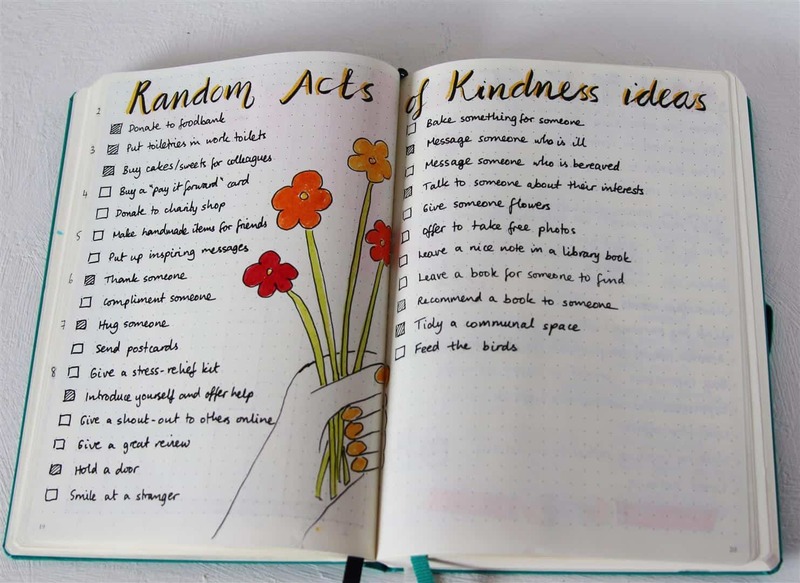 It is convenient and can be brought with you everywhere, so even in the middle of a busy day, you can grab the journal and write in it for a few minutes. 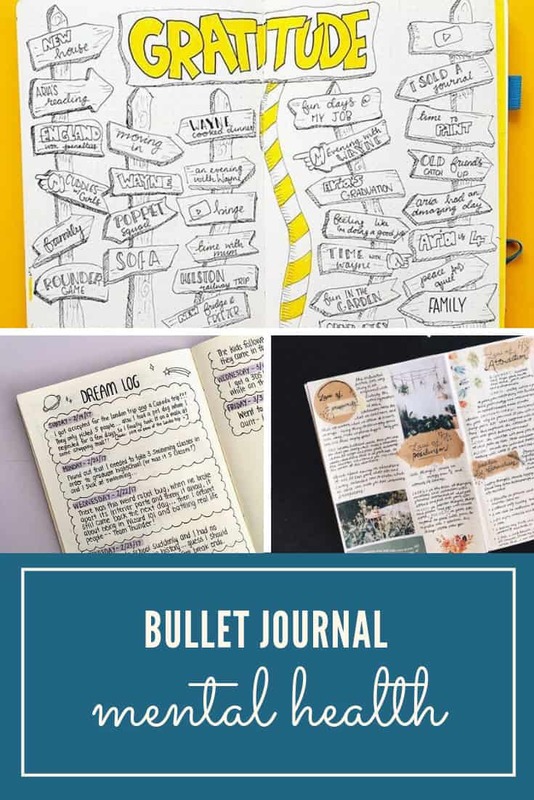 And of course if you already have a BUJO it makes sense to use that journal, so today we’re sharing some Bullet Journal mental health layouts that will help you prioritise self care in 2019. When you are dealing with a lot of stress, it can make it hard to focus on anything. But you might not want to express yourself in a frustrated or angry way, especially with your friends and loved ones. 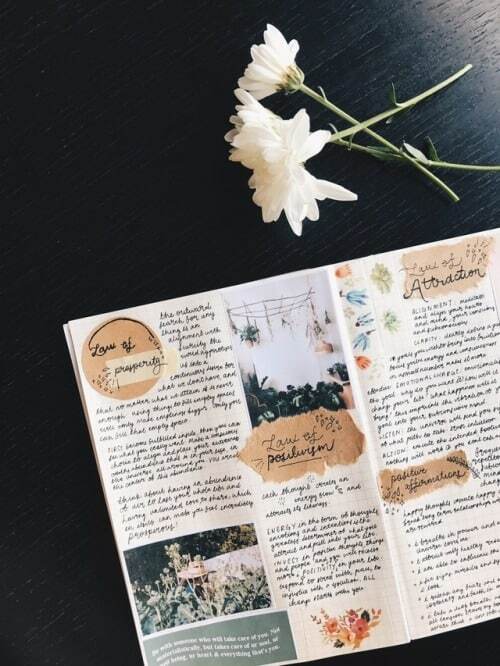 In order to practice self care with journaling and feel free to let all of those inner emotions out you should have a journal that is kept private and confidential. That way whenever you need to unload your thoughts or feelings, you can do it with the journal instead of bottling them up inside. Do you know why you have so much emotional stress? Are you sure you know the reason behind your frequent panic attacks? If you don’t, a journal can be very helpful. As you write in the daily entries, try to include information about your mood and how you’re feelings. When you feel a high amount of stress, frustration, anxiety, or depression, make a note of it. Then you can look back and see if things like caffeine or diet, work, relationships, or other aspects of your life are becoming triggers for you. In some cases, your stress causes you to constantly think about what is stressing you out, which can be very overwhelming. 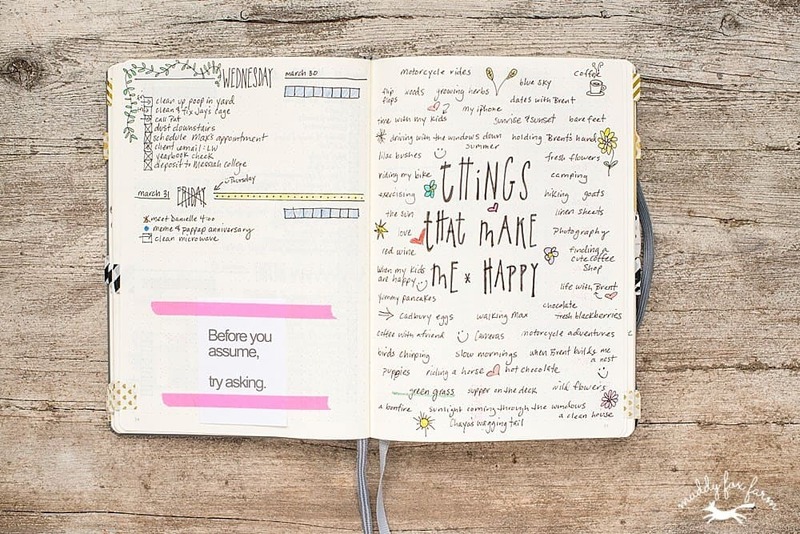 If you just want something to take your mind off it, journaling is a great option. While you are writing in your journal, you aren’t thinking about anything else but what you are journaling about. It is a really good distraction from the different issues you are dealing with that lead to your stress. 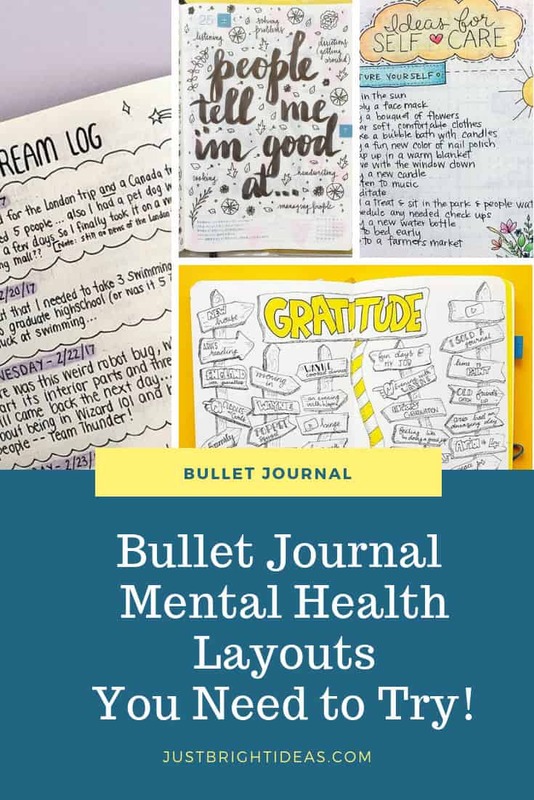 Hopefully you’re now convinced that adding some mental health layouts to your Bullet Journal are going to help you feel less stressed and anxious, so let’s take a look at some of the different layouts you can test out. Starting the day right is an important part of self care. 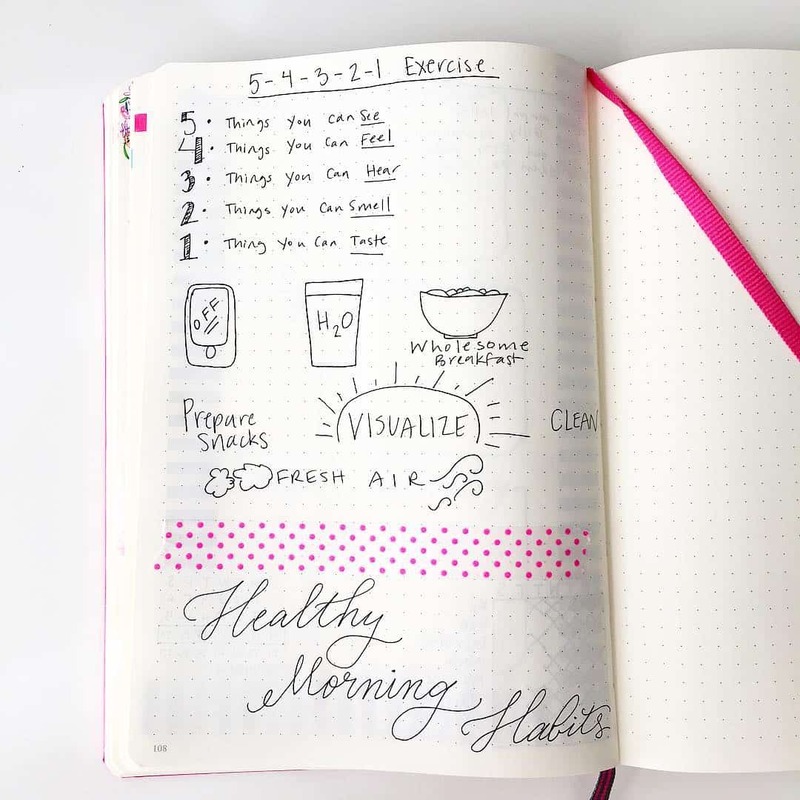 You know what healthy morning habits work for you so set aside some space in your Bullet Journal to write them down, sort of like a checklist. And if you don’t know yet a healthy breakfast, glass of water and fresh air are a pretty good place to start! Reading affirmations are a good way to calm your mind and think positively about what you want to achieve. 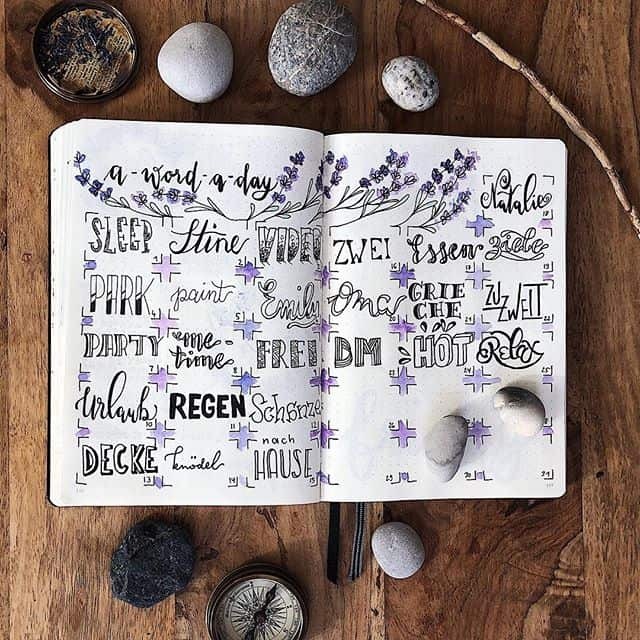 If you write out your favourite ones in your journal they will be right there at your fingertips when you need them. 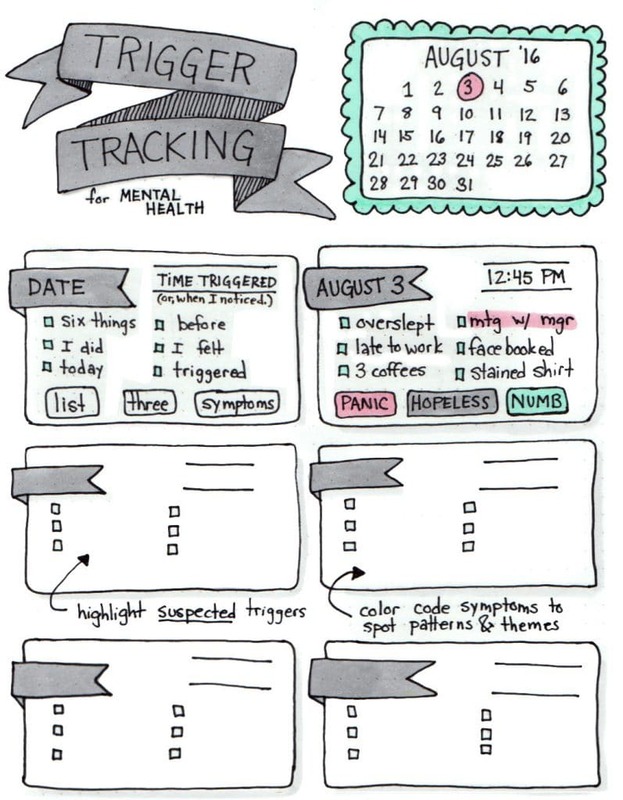 I love this idea, because when I’m stressed I find it really difficult to get things done. 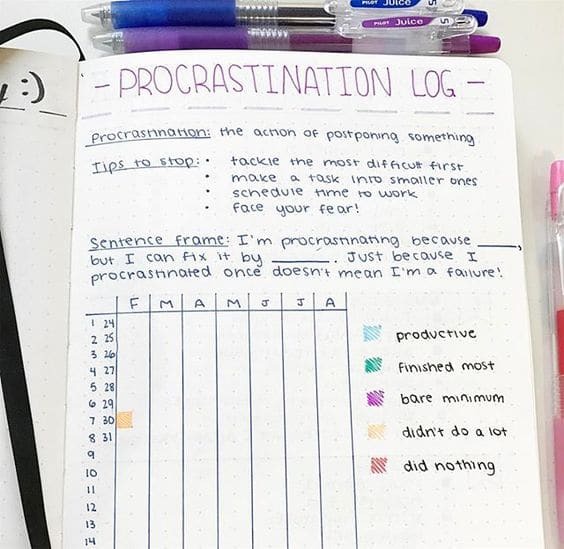 A procrastination log like this one can help you see which activities you’re avoiding so you can do something about it. When stress and anxiety kicks in so does the negative self-talk. 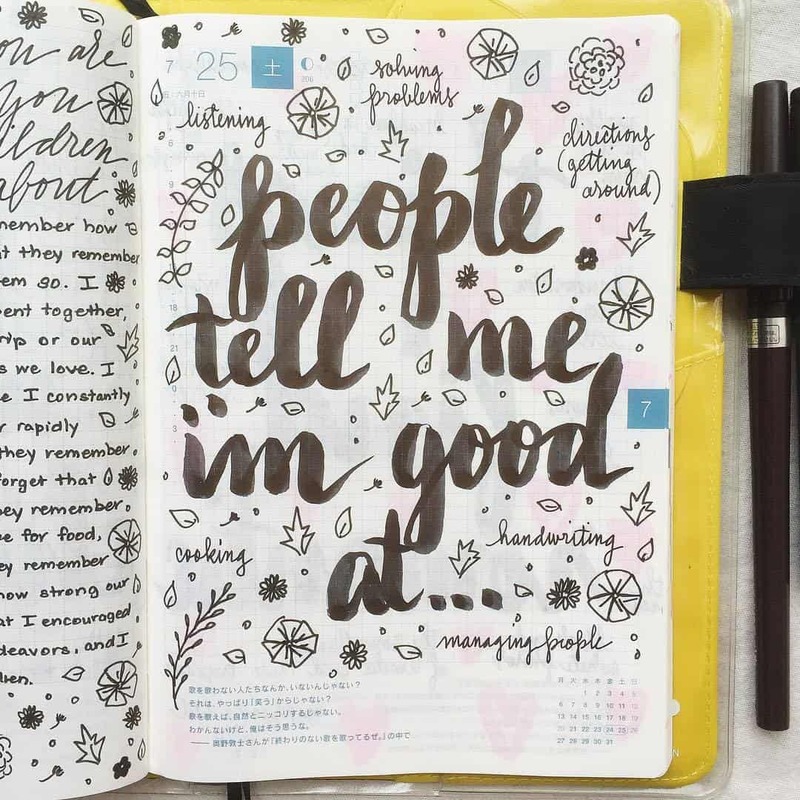 Set aside a page in your Bullet Journal to keep track of the positive things people say to you. So next time the thoughts in your head turn negative you can re-read them and remember the stuff you are good at. 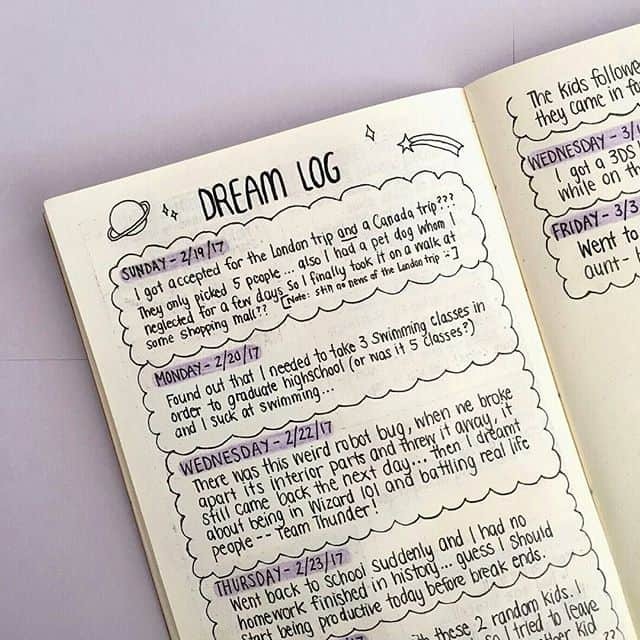 If you find your dreams become more vivid when you are anxious a dream log might help you set them aside, or try and interpret them. Did you know that there have been studies that show that gratitude can relieve depressive symptoms? Taking time out every day to write down even just one thing you are grateful for can really help your mind stay positive. And it doesn’t have to take long. 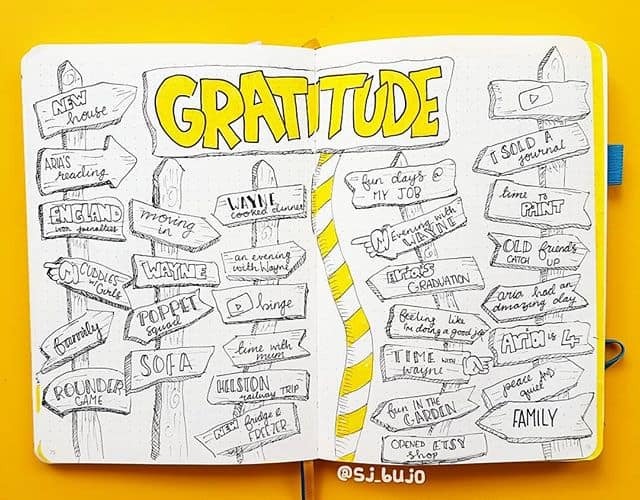 Create a gratitude spread like this one in your Bullet Journal and each morning while you’re waiting for your coffee just write down a word or two. 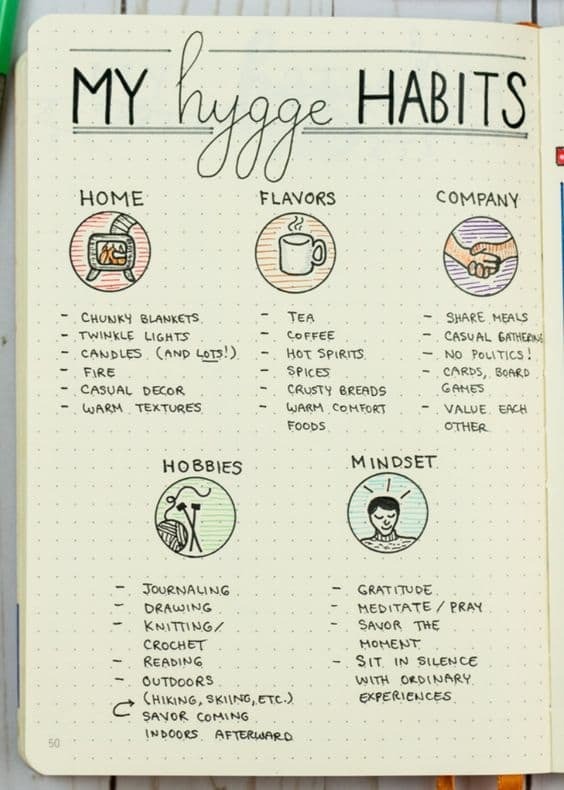 You might think that the Hygge concept is over-hyped but call it Hygge or call it self-care, when it comes down to it writing out a list of the things that bring you comfort and help you feel happy so you can actually do those things cannot be a bad thing! 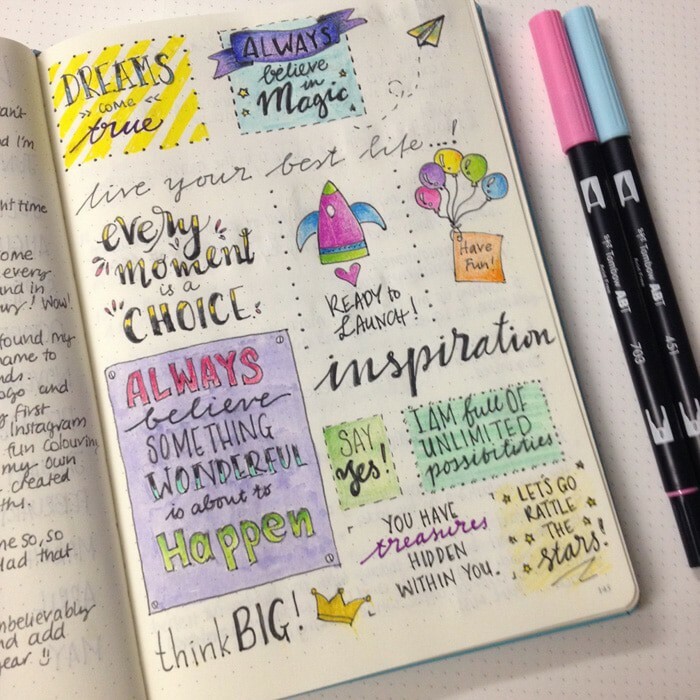 If you love inspirational quotes then go ahead and dedicate a page or three to them in your journal. Doodle them, or stick in pictures, just have them there to inspire you when you need them to. 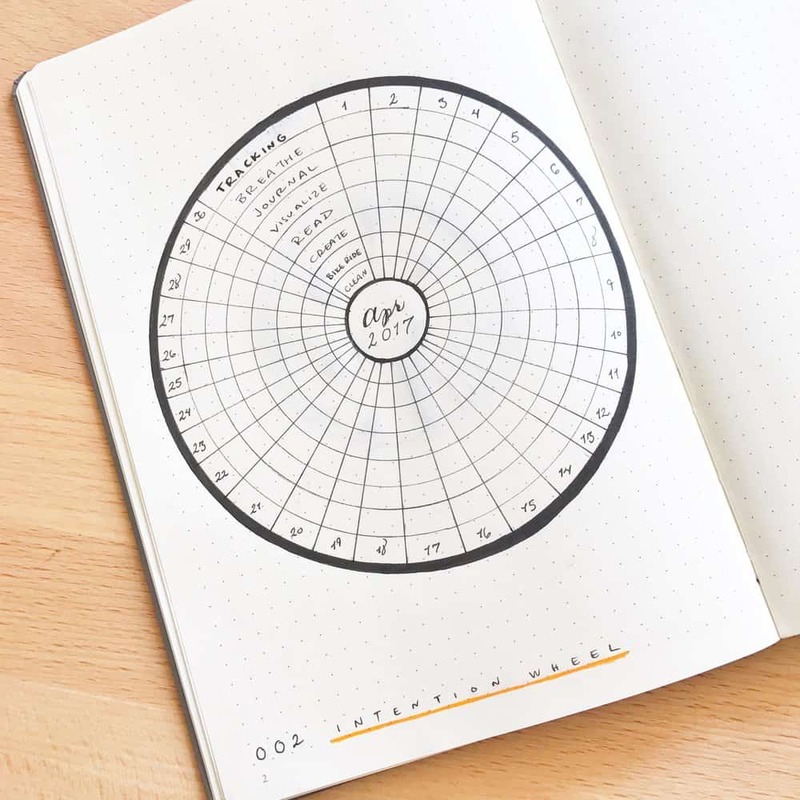 I guess in this case an intention wheel is just another name for a habit tracker. 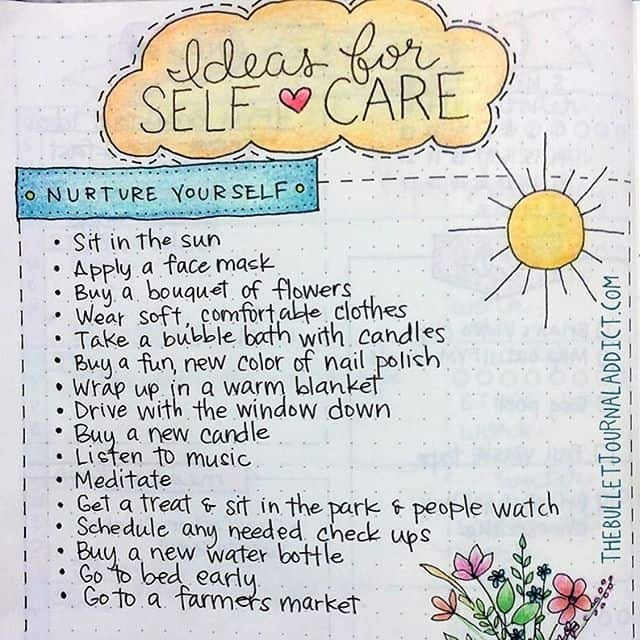 Just make those habits self care related and you’re good to go! 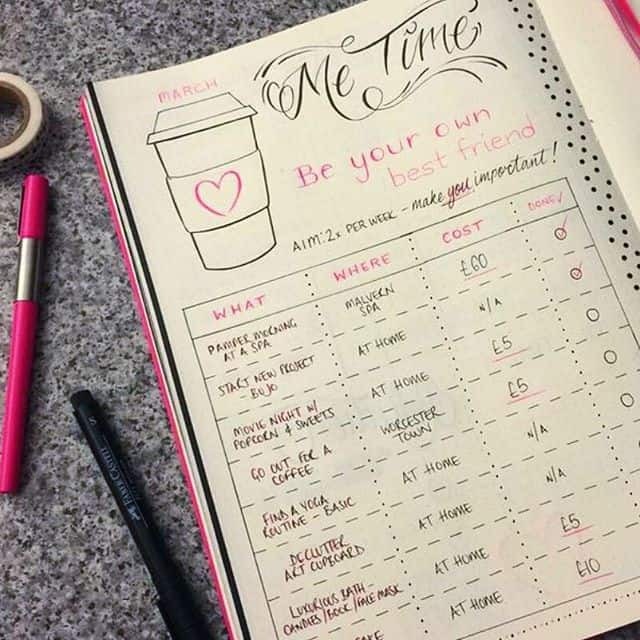 If your self-care goals include giving up vices, or adding in good habits during lent, this is a good way to track them. 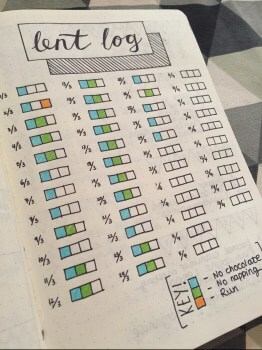 Of course a layout like this would work well as a habit tracker in any month of the year. “Be your own best friend”. This is so true, when you are stressed or anxious you need to treat yourself as you would your best friend if she were in the same situation. Of course that doesn’t come easily so on a positive day take some time out to write down what Me Time looks like. And then follow through and do those things to maintain a positive mindset. 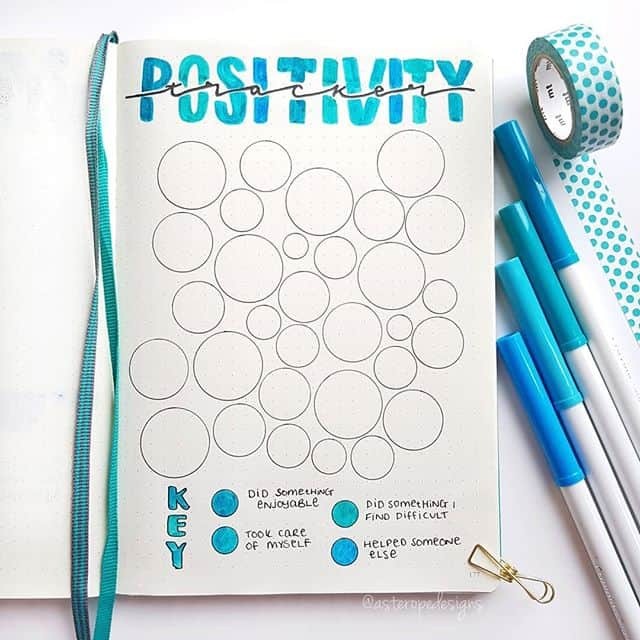 I love this idea which is a twist on a mood tracker, write down some things that show you have been positive and then color in a circle when you do them. If you really struggle with “me time” plan some random acts of kindness so you can give positive energy to the universe and feel the positivity that comes from being kind to others. This layout made me smile so I wanted to share it with you. Plus the sentiment is an important one. Write out the things that make you happy. Just doing the exercise will help lessen your anxiety, and you’ll have it to look at on those tough days. Here’s another simple exercise you can do writing down activities you can do when you have less than 30 minutes to spare. Instead of picking up your phone and scrolling facebook pick an item from the list and look after you. Those ideas are important so here’s another layout to inspire you to do it. When you want to achieve something at work you set a goal right? And then track it. 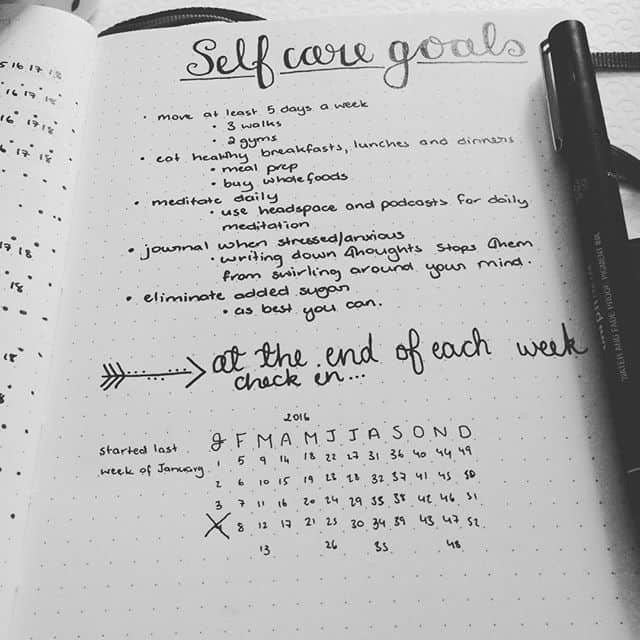 Self care is just as important so set yourself some goals and then check them to make sure you follow through. I love this idea! 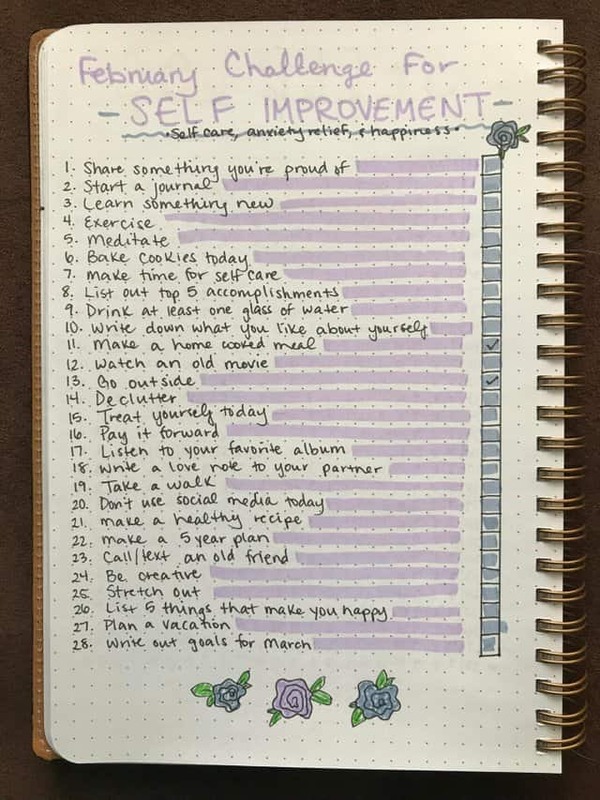 Sometimes we need a challenge to make us actually do things, so set yourself a self care challenge. You could do this by yourself or make it a group thing with your friends. If you can feel your stress or anxiety levels rising but you’re not really sure what’s making you feel that way try making a trigger tracking layout like this one. This is another activity to carry out on a good day so the instructions are there on the bad days. 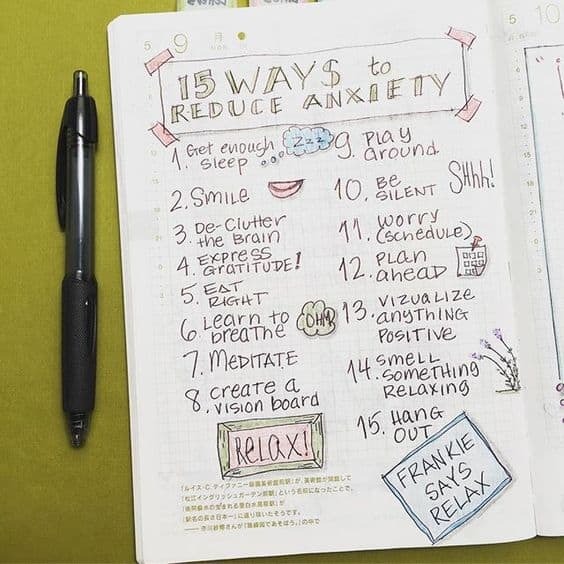 This time its a list of simple ways you can reduce your anxiety. 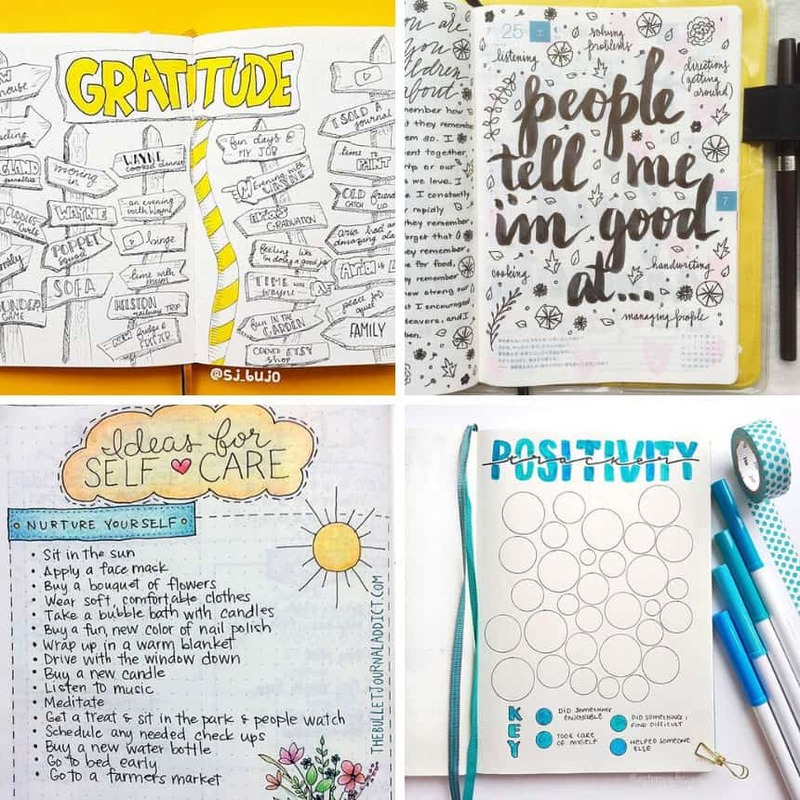 If you’ve been bullet journalling for a while you might have taken part in the doodle a day challenge, well this is similar but each day you write out a positive word. 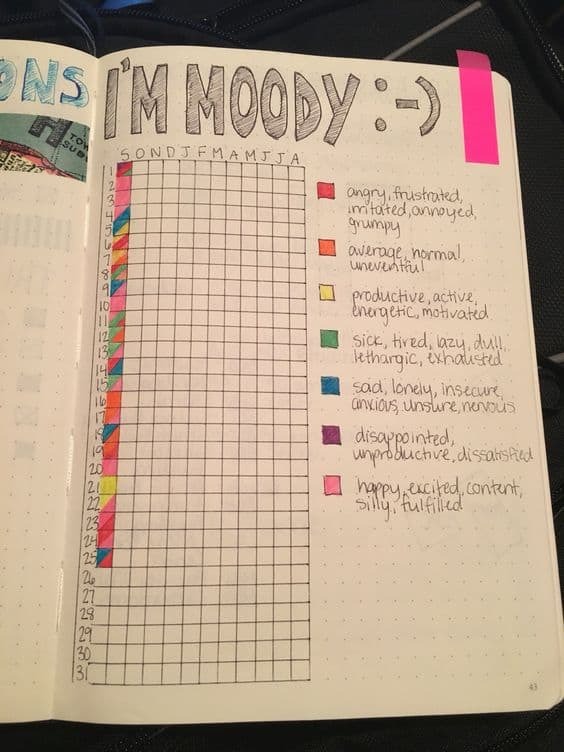 What would a collection of Bullet Journal mental health layouts be without a mood tracker? And yes, put a sticky note in the corner so it’s easy for you to locate and complete every day. Or you could try a year in pixels layout like this one. Another way to maintain a positive outlook is to cherish the memories and milestones for you and your family. 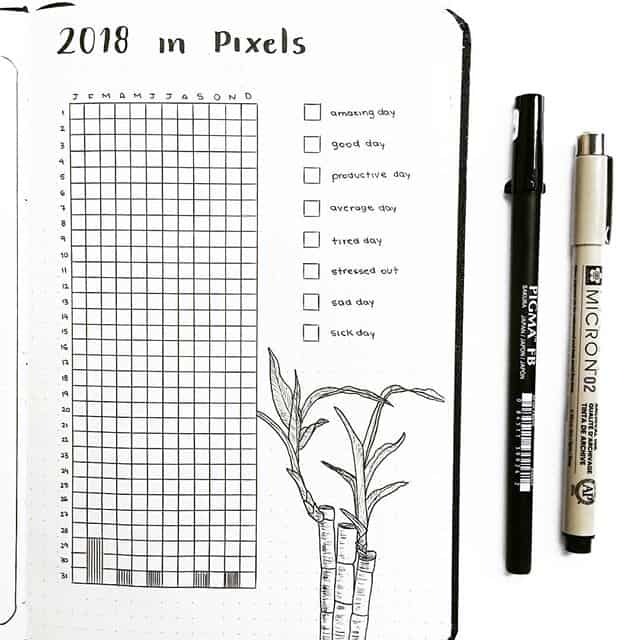 So set aside some space in your Bullet Journal for a layout like this one. And celebrate the little things as well as the big ones!